The spectacular island of Bali in the Indonesian archipelago offers a fantastic mixture of tribal culture, picturesque beaches, exciting activities and world-class amenities. Bali is an island paradise that has something for everyone to enjoy on vacation. With Bali being a popular international vacation destination there is a wide selection of flavors and cuisines on offer as well as local foods in Bali. There is something for everyone to suit all tastes and budgets. Modern museums, beachside resorts coupled with a mixture of natural and ancient cultural attractions can be found in Bali. Nature sightseeing is a must with Bali’s large forest areas and untouched coastlines that offer spectacular scenery and picturesque photograph opportunities. Bali is a fairly safe place to visit although there have been terrorist attacks on tourists in the past so it's advised to keep your wits about you and exercise caution at all times. Make sure to check your country's travel advice website before booking your vacation. 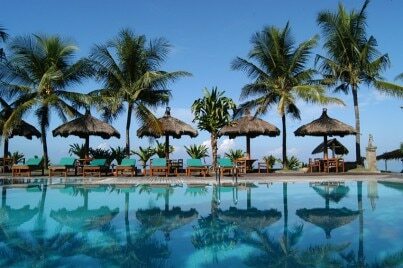 Bali is an exciting vacation destination that has something for everyone of all ages and tastes to enjoy. From sporting activities to adventure tours, shopping, dining and nightlife, Bali is a truly entertaining place to visit. Shopping in Bali is fantastic with an abundance of markets offering inexpensive locally made goods coupled with modern shopping centers filled with brand name fashion labels. Expect to pay normal prices for international brands while locally made goods are relatively inexpensive.